Natural fabrics are better for you and the planet, but making them requires chemically-intensive agricultural operations that often negate their superiority. Synthetic fabrics can be made faster and more cheaply in a lab, but most if not all are petroleum based and contain even more harmful chemicals than conventional cotton fabrics. Scientists have been searching for a bio-based alternative to synthetics like nylon or kevlar that are both affordable and sustainable. Hemp, milk, and even spider silk are promising options, but new research from the American Chemical Society indicates that an even more viable solution might be found under the sea. The hagfish is an eel-like fish that produces a thick slime to protect itself against predators. Researchers say this slime could be key to the planet-friendly fashion of the future. 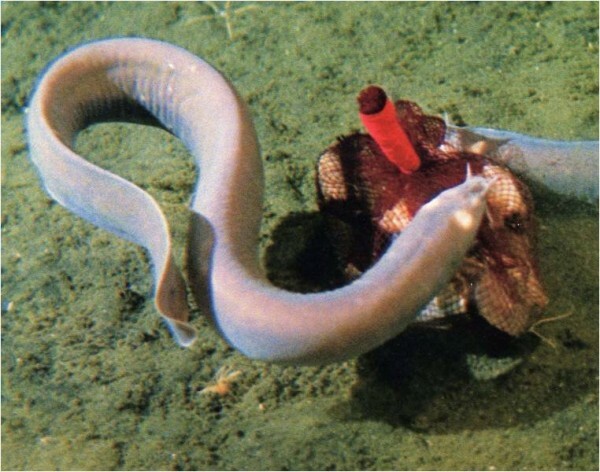 In the wild, the hagfish produces a thick slime to protect itself against predators. A single Atlantic Hagfish can produce quarts of slime in a matter of seconds. This ooze will clog the gills and suffocate other fish if they get too close. Although it looks and feels like slime, scientists say this ooze is actually consists of tens of thousands of remarkably strong threads, each 100 times thinner than a human hair. These threads are of extreme interest to scientists who say they may serve as a model for lab made fibers. Lead author Atsuko Negishi and her colleagues recently developed a method for drawing hagfish slime thread proteins into fibers comparable to lab-made spider silk. The process is detailed in a paper recently published in the journal Biomacromolecules. They say that if the process can be scaled, we may be sporting hagfish-inspired shirts and pants in the future.